Apple has just released beta 2 of its next generation iPhone operating system. All developers and those eligible to download the iPhone beta, can do so now at Apple’s Developers site. 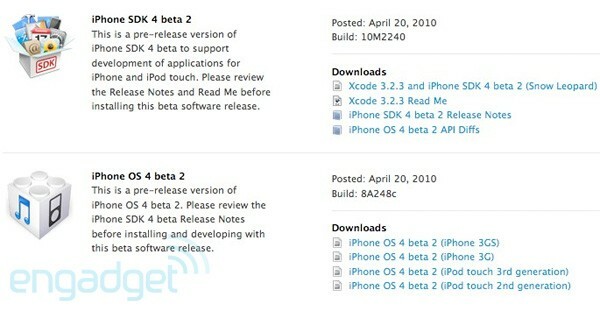 They have just updated the iPhone OS 4.0 to beta 2 and the iPhone 4.0 SDK to beta 2. OS 4.0 beta 1 has been in the news quite a bit. Some of our favorite iPhone hackers have already successfully jailbroken the first beta. The Dev Team has already announced and released a ‘beta’ jailbreak for iPhone os 4.0. They released redsn0w 0.9.5 BETA, supporting only the iPhone 3G and only available for Mac OSX. It uses the same pwnage2 DFU-mode exploit that we’ve been using since the 2.x days. There is nothing yet about a jailbreak for beta 2, but if you have already jailbroken beta 1, I suggest you wait for the Dev Team to make an announcement before you update. You can read our article here at BlogsDNA for more info on the beta 1 jailbreak. Getting back to the news at hand, the latest beta is only for registered developers with Apple. You need a properly-registered developer UDID to be able to install and activate any of the iPhone betas. As of right now no new features have been reported yet, but hopefully this beta will be a little more stable than the first. For all the latest iPhone OS 4.0 beta news and jailbreak news stay tuned right here, we will keep you posted as soon as we know more about beta 2. Buggier than first it seems. Camera app wont save pictures, although you can use MMS to access camera app and send them ok.
Funky new animation when switching between running apps. activation was instant – loving beta 2! !